Cairns Dive Adventures > Reef Info > Where is the Great Barrier Reef Located? The Great Barrier Reef is in the Coral Sea, on Australia’s north-eastern coast. It stretches more than 2,300km along the state of Queensland’s coastline, beginning at the tip of Cape York Peninsula in the north and extending down to Bundaberg in the south. The Great Barrier Reef is ideal for Cairns Scuba Diving. 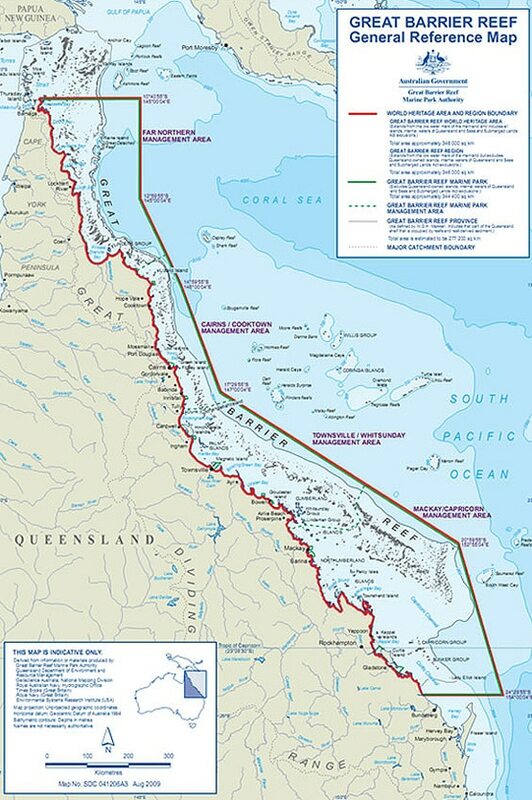 The Great Barrier Reef World Heritage Area encompasses approximately 348,000km2 and extends from the low water mark of the mainland to include all islands, internal waters of Queensland and Seas and Submerged Lands Act exclusions. Visible from outer space, the Great Barrier Reef is the world’s largest living organism and is a place of remarkable natural beauty and biodiversity. Its physical size, when taken as a single unit, is larger than Switzerland, Holland and the United Kingdom combined. In Australian terms, its area is larger than Tasmania and Victoria combined. It is the world’s largest coral reef ecosystem and a critical global resource, as was recognized when it was added to the United Nations Educational, Scientific and Cultural Organisation’s (UNESCO) World Heritage list as a natural site on 30 October 1981. To be added to the list, the Great Barrier Reef met all four natural criteria. The Great Barrier Reef provides a habitat for rare and threatened species of plants and animals and for in situ conversation of biodiversity. The Great Barrier Reef has outstanding examples representing significant ongoing ecological and biological processes in the evolution and development of terrestrial, coastal and marine ecosystems and communities of plants and animals. The Great Barrier Reef has outstanding examples representing major stages of the earth’s history including: the record of life; significant geomorphic and physiographic features; ongoing geological processes in the development of landforms. The Great Barrier Reef contains superlative natural phenomena and areas of exceptional natural beauty and aesthetic importance. In recent years, post-World Heritage listing, Australia’s state and federal governments increased the level of protection afforded to Great Barrier Reef Marine Park to include subsoil beneath the seabed to a depth of 1,000m and the airspace above the waters to 915m. Occupying such a large tract of space, it is little wonder that the Great Barrier Reef contains more than just coral reefs. Other natural features include: mangrove estuaries; sandy and coral cays; continental islands; sea grass beds; algal and sponge gardens; sandy and muddy bottom communities; continental slopes and deep ocean troughs. Cairns in Tropical North Queensland is the gateway to the Great Barrier Reef and the best place to base yourself for a visit. Cairns is the closest coastal city to the Great Barrier Reef, meaning less travel and more time on the reef. It offers over 500 day tour options, including snorkel and dive tours to the Great Barrier Reef, its islands and coral cays. Cairns is also home to the Daintree Rainforests and within driving distance of Cape Tribulation, where the rainforest meets the reef. Cairns is a safe, tropical holiday destination with world class attractions and Australian tourism award winning attractions and well know for Cairns Diving. A ‘must do’ inclusion on any Australian Great Barrier Reef holiday itinerary.